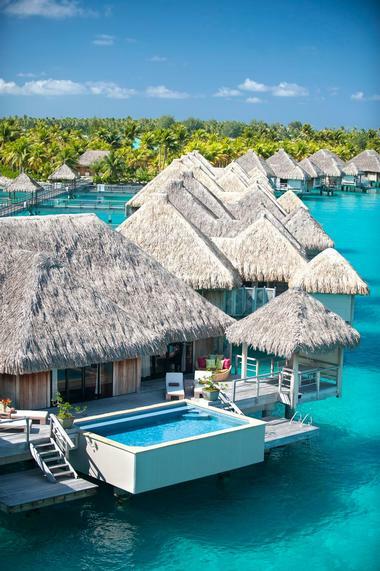 Tucked away on the French Polynesian island of Bora Bora, the St. Regis Bora Bora is an idyllic haven of tranquility surrounded by lush tropical landscapes of swaying palms, white sandy beaches and gin-clear waters. Spread over 44 acres and boasting luxurious accommodations, gourmet restaurants, an exclusive CLARINS spa and world-class facilities, the St. Regis Bora Bora offers discerning guests a heavenly Polynesian paradise. The resort features grand overwater and oceanfront villas with spectacular views of the ocean and the extinct volcano of Mount Otemanu and five excellent restaurants serving a range of cuisine. 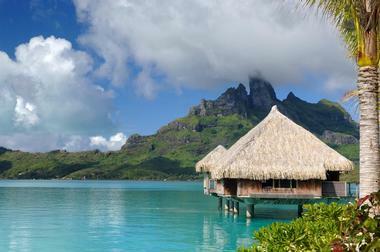 Home to powder-white beaches of footprint-free sands, lush tropical vegetation and azure ocean waters, Bora Bora is a magical destination for a romantic getaway, dream honeymoon or adventure-based holiday with activities ranging from snorkeling, scuba diving and swimming, to jet skiing, kayaking or just relaxing on the idyllic beaches. 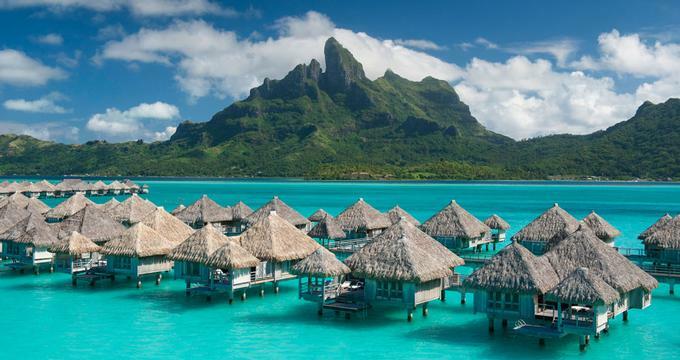 Designed for comfort, style and absolute luxury, accommodations at the St. Regis Bora Bora feature luxe villas set over the water or on the beach with contemporary island-style décor, outdoor wooden decks with private infinity pools, and stunning ocean views. All villas and the ultra-opulent Royal Estate feature deluxe facilities such as glass floor panels for underwater viewing, indoor and outdoor showers, king size beds with imported linens, en suite bathrooms with soaking bathtubs, double showers, plush bathrobes and organic bath products. Located just a few steps from the powder-soft sands of the beach, One-Bedroom Pool-Beach Villas and One-Bedroom Oceanfront Pool Villas are 1,636 - 2,700 square feet in size and have beautiful views of the swimming pool or the beach. These captivating villas have private gardens with plunge pools, outdoor showers and quaint dining gazebos for al fresco dining under the stars, and Pool-Beach Villas have their own separate pontoon areas with access to the sea. Villas are furnished in a traditional Polynesian-style with soft wooden décor, luxurious woven textiles and hand-carved Polynesian sculptures that depict island life. Floor-to-ceiling windows flood the villas with natural light and offer breathtaking views of the lagoon or reef. Separate bedrooms feature king size beds with imported linens and Italian marble en suite bathrooms feature spacious dressing areas, sunken bathtubs, separate rain showers and double vanities, along with Remède Spa bath products. Light-filled living rooms are equipped with designer sofas and modern amenities such as 42-inch Plasma screen televisions, MP3-outfitted Bose DVD/CD player and surround-sound system, an espresso/coffee maker with complimentary teas and coffee and a fully-stocked minibar with a variety of refreshments. 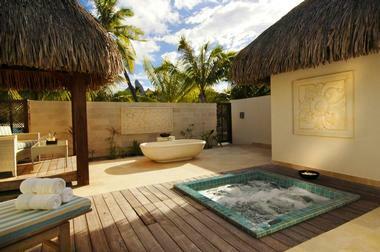 Oceanfront Pool Villas feature an additional daybed nook for extra guests. Pusing Bora Bora’s exquisite natural beauty with the legendary St. Regis charm, Overwater One-Bedroom Villas offer a bespoke island experience. Overwater One-Bedroom Villas are designed in a variety of styles, ranging from Classic Overwater One-Bedroom Villas with lovely lagoon views and secluded beachfront Superior Villas, to Deluxe Villas, which overlook the gin-clear lagoon. Premier Villas, feature a private pontoon, covered daybed, an outdoor whirlpool and spacious living rooms with daybed nooks. All Overwater One-Bedroom Villas boast expansive terraces with outdoor showers, outdoor dining area under gazebos and comfortable deck chairs. Naturally lit by floor-to-ceiling windows, villas are decorated with native wood and traditionally woven textiles, authentic Polynesian sculptures and scenic paintings, and have indoor glass viewing panels offering underwater views. Separate bedrooms feature king size beds with imported linens, and Italian marble en suite bathrooms feature spacious dressing areas, sunken bathtubs, separate rain showers and double vanities, along with Remède Spa bath products. Premier technology abound with 42-inch Plasma screen televisions, MP3-outfitted Bose DVD/CD player and surround-sound system, an espresso/coffee maker with complimentary teas and coffee and a fully-stocked minibar with a variety of refreshments. The Royal Two-Bedroom Pool Villa is 3,455 square feet in size and offers spectacular views of the islands of Ra’iatea and Taha'a from a coral-hued stone terrace, which is home to two alfresco-style dining gazebos, elegant deck chairs and an inviting infinity pool. Decorated in exotic wood accents and traditionally woven textiles, scenic paintings by local artists and hand-carved Polynesian sculptures add a unique touch while floor-to-ceiling windows flood the villa with natural light. A gracious living room offers state-of-the-art technology, including a 42-inch television, MP3-compatible DVD/CD player and Bose Surround Sound system. An espresso machine and fully-stocked minibar provide refreshment throughout the day. Glass viewing panels provide glimpses into the turquoise waters below, and two inviting bedrooms feature king size beds and two Italian marble en suite bathrooms with rain showers, sunken bathtubs, dressing areas and deluxe Remède Spa bath products. The Royal Overwater Villa is a beautifully appointed two-bedroom and two-bathroom suite spread out over 2,852 square feet and home to the largest suspended pool in the South Pacific. Luxuriously designed in exotic noble woods and Italian marble, this suite boasts a spacious, central lounge with comfortable sofas, glass viewing panels in the floor and modern amenities. Two bedrooms are set with lavish adjoining en suite bathrooms with sunken bathtubs, separate rain showers, double vanities,and Remède Spa bath products. A wide wooden terrace has two symmetrical dining gazebos and a sparkling plunge pool with stunning views over the water and of Mount Otemanu in the distance. The Royal Estate presents the ultimate St. Regis Bora Bora Resort experience with a 13,000 square foot villa surrounded by coral walls on three sides and its own private beach facing Bora Bora’s beautiful lagoon. Exquisitely decorated, the villa features three expansive bedrooms with king size beds, four bathrooms with showers and whirlpool bathtubs, spacious lounge, dining and entertaining areas, a fully equipped gourmet kitchen and a central courtyard and solarium with a private light-reflecting white glass mosaic swimming pool. The master bedroom has its own private pavilion with sauna, steam room, whirlpool bath and private gazebo while a large wooden sun terrace has deckchairs, beach umbrellas, outdoor shower and tables and chairs for outdoor entertaining and dining. All bathrooms feature rain showers, sunken bathtubs, dressing areas and deluxe Remède Spa bath products, and floor-to-ceiling windows flood interior spaces with natural light and gorgeous ocean views. A separate office provides a quiet space to work, and additional amenities include 42-inch televisions, MP3 versatile CD/DVD players, a Bose Surround Sounds System and complimentary wireless Internet. Guests of the Royal Estate enjoy dedicated butler service and a private chef if required. The St. Regis Bora Bora Resort offers a selection of exceptional dining experiences created by award-winning chefs from premium local ingredients gathered from the island and its surroundings. Three restaurants and two bars provide an array of stunning venues to wine and dine in style surrounded by breathtaking views, and room service is offered for those who would rather dine in privacy and seclusion. Lagoon Restaurant by Jean-Georges is the resort’s signature restaurant, serving an unrivaled French- and Asian-infused menu of fresh seafood and hand-reared meats created by celebrated chef Jean-Georges Vongerichten. Featuring a full-service bar that serves a modified snack menu, the restaurant is situated over the water with spectacular views of the mythic Mount Otemanu. The Japanese Sushi Take Restaurant serves beautifully fresh sushi and sashimi with sake, using fresh local seafood and homegrown vegetables and salads in a smart-casual setting. Located beachside and open all day, Te Pahu is an authentic Polynesian-inspired restaurant that serves a mouthwatering range of traditional Polynesian fare. Executive Chef Yann Mikolajczak’s presents a menu of delectable dishes, including poached lobster in a smoked kombu broth, marinated Tahitian-style raw fish, poached uravena with XO artichoke, and island-inspired desserts. Far Niente Ristorante honors the traditions of Italian cuisine with a tasty selection of authentic dishes made from Italy’s distinctive produce and perfectly complemented by an expert choice of regional wines. The Aparima Bar presents a casual, relaxed poolside setting in which to savor signature cocktails, refreshing drinks and light snacks at a cool swim-up 10-seater bar. The St. Regis Bora Bora offers an array of activities, from water sports such as snorkeling on the colorful reefs and sailing on warm sea breezes to rich cultural and historical experiences like hiking up the majestic dormant volcano of Mount Otemanu. A private saltwater lagoon offers outstanding swimming, snorkeling and stand-up paddle boarding on the tranquil waters while scuba diving can be enjoyed in the deeper waters of the reef. Explore the waters around the island by kayaking or canoeing in your own personal craft, or enjoy a sunset cruise, which are the best way to soak up the beautiful views around the island and spectacular sunsets. Fitness freaks can work out in the exclusive 24-hour fitness center, which is fully equipped with state-of-the-art weight machines, cardio equipment, treadmills, ellipticals and stationary bikes. Yoga classes are run by professional yoga instructors and bicycles can be hired to explore the island. Feed fish and sharks at the Lagoonarium on Mondays, Wednesdays and Fridays or enjoy a game of tennis or private tennis lessons on the resort’s first class courts. 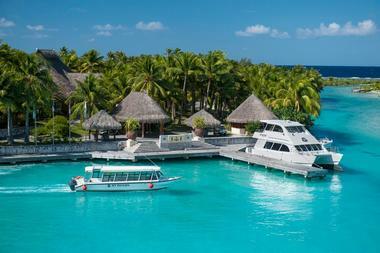 The St. Regis Bora Bora is home to the newly rebranded Miri Miri Spa by CLARINS. Spread over 13,000 square feet on its own private islet and facing the lagoonarium with beautiful views of the Mount Otemanu, the spa features five luxurious treatment rooms, saunas, steam rooms, whirlpools, ladies’ and gentlemen’s changing areas, an elegant relaxation lounge and a private beach. Spa services include an array of Polynesian, Asian and Clarins Touch treatments, Clarins Body Treatments, Clarins Signature Massages, Clarins Pro-Aromatic Facial Treatments, Clarins Pro-Aromatic Body Treatments, Clarins Treatments for Men, Clarins World Massages, Water Treatments, Hand care/Foot Care, Waxing and Yoga. 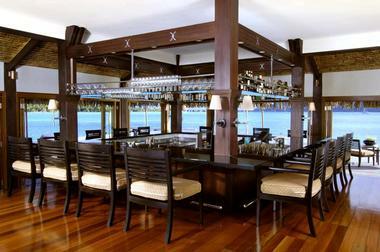 St. Regis Bora Bora offers elegant venues for meetings, social events and functions with mesmerizing views of the lagoon. Combining luxurious accommodations, captivating venues, award-winning cuisine and personalized service, St. Regis Bora Bora Resort provides all of the elements for an unforgettable occasion. Dedicated conference and catering managers are on hand to assist with every detail from room décor and flower arrangements to custom made catering menus and bespoke wedding and business function arrangements. The St. Regis Bora Bora Resort has the Family Traditions at St. Regis program, which includes a special Kid’s Club that entertains the little ones with a variety of fun-filled activities. Kid’s Club services include a personalized in-room greeting, an indoor play area with a diverse range of activities and adventures ranging from story-telling and Polynesian arts and crafts to video games. Outdoor activities include beach games, sand castle building, swimming, sailing, tennis and coconut demonstrations. Specialized services for parents include babysitting services, cribs and child size bathrobes, children-friendly movies and in-room toys on request. 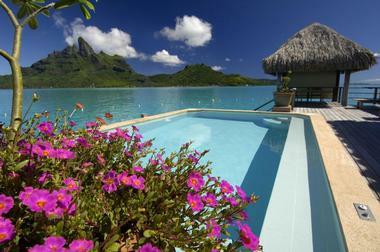 Back to: Best Bora Bora Honeymoon Hideaways.